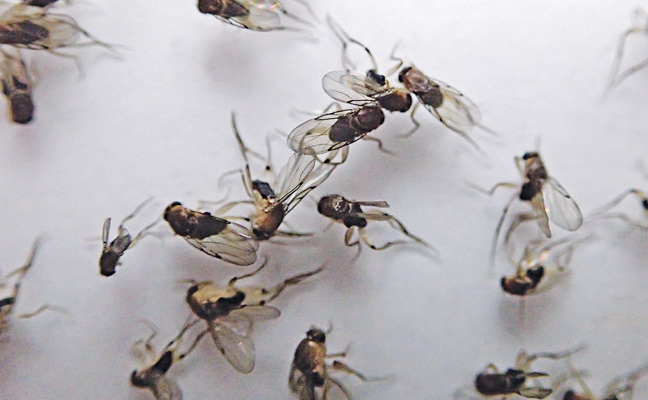 Question: We’re dealing with a complicated phorid fly problem that has it all: consecrated soil that can’t be removed, a leaking crypt and a heavy influx of visitors. The problem is in the mausoleum. The church is attached, but the flies aren’t moving into that area much. The church wants this problem solved in any way that doesn’t require us to cause destruction to the building. Should I try a biodegrader to eliminate the breeding source, or an insect growth regulator (IGR) to break the life cycle? Thanks for lending your expertise! Bioremediation is happening already, and the organisms involved are far better than the ones we use for drains. IGRs are an intriguing idea, but delivering a sufficient dose to the correct location would be difficult. Even if you knew where all the breeding was occurring, it still would be a long shot. Introducing an insecticide into the crypts or the drainage bed would be disappointing. At best, you would get a temporary reduction for a while, maybe a week. Then, the flies would return — slowly at first and then back to full strength. This is true for all the insecticides you might consider, even borates. Borates kill everything, including insects, fungi and bacteria. Eventually the borates are sequestered (taken up), leached away, or diluted to the point of no effect. And then you would have to start all over again. This classic dust-to-dust stuff has been at work since the beginning. The process is slower for embalmed bodies, but the decomposers win in the end. You may have better success by preventing flies from entering the “living space” (pardon the expression). Use a fine mesh to seal openings around individual crypts; appearance is important, so be careful. Be sure to seal the vent on the roof. If they can’t be kept out, you might try killing them as quickly as possible. An insecticide “sticker” product might be appropriate here, but you would need to find a suitable location for placement. Many phorids, including coffin flies, are heavily attracted to light. A well-placed electrocuting insect light trap (ILT) might do wonders. Fit it with a catch bucket, which may fill up surprisingly fast. Many glue board ILTs would simply fill up too quickly, so don’t bother. I’m an optimist by nature, and it’s hard to conclude that there is little hope for success. If you try something and it works, please document the process and the conditions for a follow-up. We could use a definitive protocol for this scenario. I wish you good fortune.